OMG! If I asked you to come to the theatre with me to watch a play about an 11-year-old boy on a chicken farm deep in the Heartland of America who was confronting his sexuality, and whose best friend was a depressed chicken wanting to be a stand-up comic, would you say, why not? Well, if you did, you would have been rewarded for your bravery. MilkMilkLemonade, written by Joshua Conkel and directed by Anna Henare, premiered in New Zealand at the 2014 Dunedin Fringe Festival. The play begins on the chicken farm with a sturdy Christian grandmother (Phil Grieve), giving a nana lecture to her 11-year-old grandson, Emory. Such was the brilliance of Phil’s acting that I found myself being dangerously seduced by Nana’s stereotypical view of the world. This view was contrasted by the character of Emory, whose unwillingness to accept tradition caused angst for himself and the audience. The meandering storyline took the crowd on a light-hearted journey of sexuality and our quest to constantly find our place in the world. Emory, played by Jordan Dickson, did a brilliant job of wanting us to join him on his search for fame, fortune and acceptance. Ben McCarthy, who played Emory’s 12-year-old pyromaniac friend Elliot, also took us on his tumultuous excursion of life. Emory’s best friend, Linda the chicken, was played magnificently by Richard Huber with Rhiana McKay-Stewart rounding off the talented cast. I was lucky enough to see this production blind. Before the performance began, a small number of blind patrons were treated to an introduction and voice test by the characters and a touch tour of the stage and its props, along with a programme produced in braille. The performance was also supported by an audio description, which came through a talking headset and explained the non-verbal scenes. The outstanding verbal description was provided by Bronwyn Wallace in her first time as audio describer. The play was performed in the crypt of St Paul’s Cathedral, which gave an accessible air to the production with ingeniously simple props such as a huge yellow balloon playing the part of the sun. 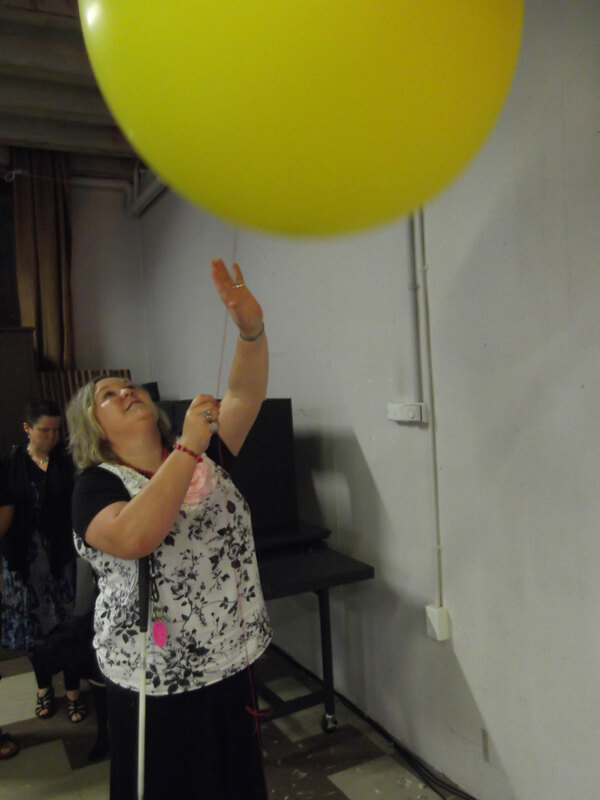 Anna informed us on the touch tour that the balloon was too big to fit in her mother’s car, so her mother ordered a mobility taxi to get it from Para Rubber to the crypt! I raise two glasses of milk and one glass of lemonade to Anna, Hurdy Dur and Wow! Productions for giving me the best chance possible of getting what this play was really all about! There’s only one problem with that, though. Humans are far too complex; now I want to be a chicken! Julie Woods, aka That Blind Woman, is a member of the Arts For All Otago Network. MilkMilkLemonade, Hurdy Dur Productions won Best of Theatre at the Dunedin Fringe Festival 2014. Original generation time 1.7824 seconds. Cache Loaded in: 0.0005 seconds.